The majority of the users admired the comfortable feel of the Nike Air Huarache shoes. A significant number of users were highly-appreciative of the stylish design of these shoes. Some users applauded the lightweight construction of the Huarache. Several users admired the sock-like fit of the shoe because of the presence of the neoprene internal sleeve. As stated by some, the Nike Air Huarache appeared more adorable on feet than in pictures. A handful of runners appreciated the breathable upper design of the shoe. This Air Huarache by Nike is reasonably-priced. Owning this shoe is like taking hold of history and Tinker Hatfield magic. The Nike Air Huarache sneakers continue to bridge the gap between the old and the young with its timeless beauty. A few reviewers, who are loyal fans of the Huarache, noted that it felt just like the shoe they bought so many years before. Size runs small based on some reviews. According to some users, the back strap of the Nike Air Huarache ripped off too quickly. Few users found the shoe too narrow. The Nike Air Huarache has always had more than its share of loyal fans. This sneaker continues to impress users with its eye-catching design and comfortable feel. The leather and textile upper as well as its rubber outsole complete the streetwear essentials. Anyone who is willing to take a ride back in time without losing the sophistication of today’s world should have no doubts about getting a pair. Many deemed it to be a valuable purchase given the significant amount of comfort it offers and its affordability. Those words will seem prophetic considering how much of an icon the Huarache turned out to be. However, the name Huarache itself almost never came to be as Tinker Hatfield initially referred to the shoe as the “Harrachi,” which is the name of a Native American sandal. The concept of the Huarache running sneaker was a eureka moment for Hatfield who realized the potential of utilizing neoprene booties for land use during one of his water skiing sessions. Hatfield observed how the neoprene bootie conformed around his ankles while his feet were resting in a water slalom ski. It also amazed him that its structure is adaptable to varying foot shapes and sizes. Days after indulging in such surface water sport, Hatfield headed to his work studio and started drafting neoprene shoes fitted for running. Stripped to the bare essentials, Hatfield came up with the Nike Air Huarache designed with neoprene and spandex inner socks. It later turned out that the inner sock that literally hugs the foot delivers unmatched comfort and a sock-like fit. With the shoe’s fit and comfortable feel, the “Huarache fit” was born. Hatfield introduced an exoskeleton support to the flimsy inner bootie to create a Dynamic Fit sneaker structure. The first silhouette appeared like a futuristic pair of sandals for the gods, a kind of sneaker that the likes of Zeus would wear. Resembling the huarache sandals from Mexico, this kick also has a strap that wraps around the heel. Initially, the Air Huarache was planned out as a running shoe. It almost didn’t hit the shelves since the concept of a sandal-resembling trainer seemed like a crazy idea. One of Nike’s product managers, who happened to be Tom Hartge, ignored the skeptics and ordered the production of 5,000 pairs of the Air Huarache. Hartge brought those shoes to the New York Marathon to dispose of to avid runners. Surprisingly, the futuristic-looking sneaker got the approval from throngs of optimistic runners that thousands of pairs got rapidly washed out in less than a week. What made it an instant standout, apart from its unique style, is its use of a foot-hugging neoprene fabric. After its debut, Nike started to release the Huarache trainer series. The original outline and shape of this shoe which was also later called the Nike Air Huarache Run made it fitting too for other categories such as cross-training and basketball. The Swoosh brand eventually dropped the Basketball, Cross Trainer, Burst, International, and high-performance Racer models which were all assembled and engineered with the famous foot-hugging inner sock. Among the popular variations that sprung from the Swoosh label right after the release of the core model are the Nike Air Flight Huarache (1992), Nike Air Huarache Light (1993), Nike Air Trainer Huarache (1994), Nike Air Max 90 Current Huarache (2009), and Nike Huarache Free 2012. Several athletes had endorsed the Huarache family, including Michael Johnson, a multiple Olympic gold winner. Because of testimonials from athletes, the shoe gained its legendary status. In 2000, Nike reissued the original green/royal blue Nike Air Huarache colorway. The Air Huarache also turned up in the skate world with the drop of the Nike SB Eric Huarache, which is named after the pro skater Eric Koston. Eventually, this performance-based shoe jumped into the lifestyle footwear category in 2014 as the demand for casual sneakers struck more and more major brands. Nike recreated this style and in the long run refreshed its racks with tweaked forms such as the Nike Air Huarache Drift, Nike Air Huarache City, and the most recent remastering, the Nike Air Huarache Gripp. Over the years, the Nike Air Huarache sneakers have been the subjects of numerous collaborations. One of the transmuted interpretations is a product between Nike and the Doernbecher Children’s Hospital. Branded as the Nike Air Huarache Run Ultra Doernbecher, this kick is an expression of creativity by a 13-year-old Doernbecher patient-designer. The vibrant fusion of colors on this kick is a reflection of how a little Brayden Sparkman battle off lymphoblastic leukemia with positivity. Another collaborative sneaker that made use of the iconic Air Huarache silhouette is the Shoe Palace x Nike Air Huarache Run QS. This white/university red Nike Air Huarache Quickstrike iteration arrived in a limited number of pairs. Its launch coincides with the 25th founding anniversary of the casual and athletic shoe retailer based in the US. This shoe is the second time that the Shoe Palace teamed up with Nike for a Huarache rendition. As a water-skiing inspired shoe, the Nike Air Huarache offers maximum comfort and style. This phenomenal shoe brings sophistication and pizazz when paired with skinny jeans and denim shorts which is why it continues to captivate the hearts of multitudes, including the most popular and recognizable names in the entertainment, music, and sports industries. Some of the stars seen sporting the Nike Air Huarache casual sneakers are Hilary Duff, Sofia Richie, Bella Thorne, Gigi and Bella Hadid, Kylie Jenner, Chris Brown, Maria Sharapova, plus a lot more. The Huarache sneakers easily stand out in the crowd, which makes it a worthwhile option for several occasions. The Nike Air Huarache white, black, pink, grey, blue, rose gold, varsity red, green, and hot lava are just some of the oodles of colorways available for this iconic sneaker. You can have it as a statement piece when you weave it with your casual and laidback ensembles. Or you can exude that sporty, relaxed chic vibe while you show off that gym-honed physique when you merge the Air Huarache by Nike with leggings and a sports bra or track pants and tank tops. 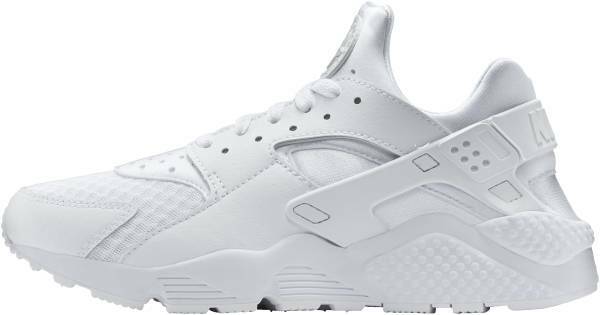 For the brave ones who are in search for a statement sneaker to match their smart casual and semi-formal attire, might be interested in the Nike Air Huarache all white or the triple black versions. These sandal-like sneakers with form-fitting neoprene bootie uppers are relatively priced above the average cost of standard Nike sneakers. Among the most affordable range of Nike Air Huarache casual shoes are valued at $110. The neoprene and spandex materials of the low-top Nike Air Huarache offer a snug and comfortable fit. Available in medium width, this shoe provides a pleasurable fit for users with standard foot measurements. The Nike Air Huarache shoes run true to size. The Nike Air Huarache kicks in men’s sizes range from 6 to 15 US. On the other hand, the Nike Air Huarache women’s exclusive silhouettes come in sizes from 5 to 12 US. For a shoe of this kind, basically, everything is a noteworthy feature. It starts with the rather obvious heel counter that is quite the topic among Huarache loyalists. The heel stands out because of the support it gives to runners and sneaker people. Because of its size, it is easily a very prominent feature in this shoe. The heel has been used as a platform in bringing out the best colors and style of this shoe. Although not as evident as the external heel counter, the inner sock design of this shoe is just as impressive. This feature is so remarkable that it remains to be a key part of the shoe’s design since it was first introduced to the sneaker world. Adding to this amazing feature is the fact that most variations carrying the Huarache name still carry this technology. Michael Johnson, an Olympic gold medalist, endorsed the Nike Air Huarache in commercials. In 1991, the known American comedian and sneakerhead, Jerry Seinfeld wore the Huarache in one of his TV shows. Because of the impressive fit, Tinker Hatfield borrowed the design of the neoprene water skiing shoe in his Huarache creation, adding the neoprene and spandex inner sock in its original design. The Air Huarache by Nike is available in customizable option with NIKEiD. Via the NIKEiD, you may tweak the hue and materials on the different segments of the shoe or give your customized kick a unique speck of color and a hint of personalization. Parts of the shoe that can be revised via the NIKEiD are the overlay, toe, base, lining, laces, strap, tongue, midsole, and outsole. An EVA midsole and Air-Sole unit combine to provide cushioning and shock-absorbing qualities in the Air Huarache. There are several moderately large perforations in the upper for more ventilation. The outsole has flex grooves for flexibility. OG versions of the Nike Air Huarache are almost always sold out in minutes. Some of the oldest releases that have Tinker Hatfield’s signature are the holy grail of thousands of sneakerheads. Buyers can choose the type of upper material they want as depending on the color.